This layout runs along your yard’s perimeter. This layout allows your dog access to the entire property. The twisted wire joins the house transmitter box to the boundary wire. This enables the dog to safely walk over the twisted wire path. The challenge in doing a backyard only installation is that you want the house side of boundary to be inactive so your dog can freely enter and exit your home without getting the correction. However, for the system to work, you still need a full loop of single (untwisted wire). We create a loop that goes tight around the front of the house too. This completes the loop, but there is not enough space around the front of the house for the dog to have access to the front yard. 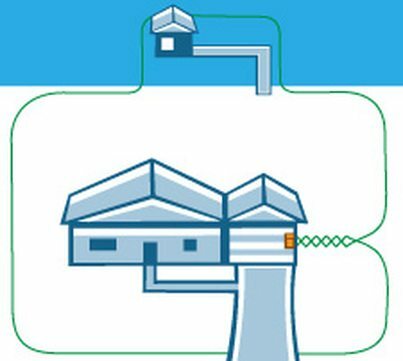 We go around the three sides of your yard, then double back to make a U-shaped loop. The two opposite wires need to be separated by at least six feet to avoid the signals from one loop from interfering with the other. We can also add small exclusion zones to keep your dog out of small areas within your property. 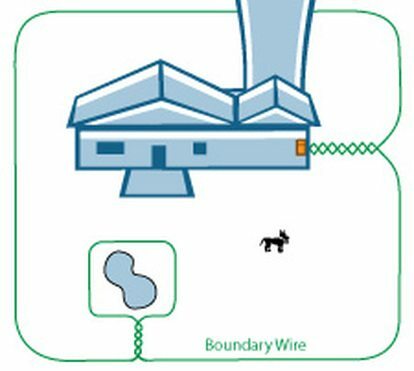 For example you may want your dog to have full access to your yard except for a small garden bed.To do this we loop some boundary wire around the area you want to protect and join the loop to the main loop with some twisted wire. 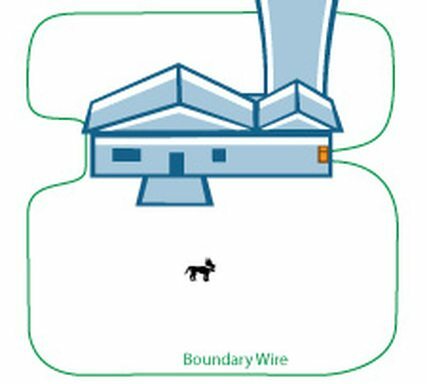 The hourglass layout contains the dog in both the front and back yard, but does not allow the dog to cross between the front and back yard. This is great if you want the dog with you in the front or back yard but do not want them crossing between them. On a lake front property, if you’d like to incorporate the lake into your fence we have several options. There is no danger for your dog to receive a correction when swimming. The correction level will not change or pose any sort of safety threat. We submerge extra boundary wire out into the lake at your desired distance. Do you want your dog to just be able to walk into the lake a few feet? So he can get a drink or lay down in the water to cool off? Or do you want him to be able to go for a deeper swim? We can sink the wire in up to six feet of water. If you have enough yard space, we can use a double back approach to create a three-sided boundary. 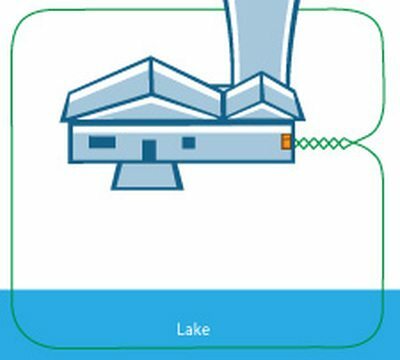 This is a modification of the first where we incorporate the dock and boat house, but the lake is otherwise not incorporated into the fence plan.